It’s important to understand the laws around metal detecting. If you don’t own the land, you must ask the owner’s permission. And metal detecting on protected land may be prohibited. Metal detectors evoke thoughts of buried treasure and long-lost artifacts. Even if you don't strike it rich, they can still provide hours of entertainment to young and old alike. And you'll be grateful you have one if you ever lose a valuable piece of jewelry while out and about. But before you can be off on your next adventure, you first need to choose the right metal detector for the job. Here's a short guide to help walk you through all the important considerations when choosing one. Ask yourself where you plan on metal detecting and what you're hoping to find. Let this be your guide when choosing a metal detector. For example, if you're hoping to search in or around water, you should select a metal detector that has waterproof coils. If you don't want to keep digging up old pieces of junk, choose a model that has a discriminator to filter out less valuable metals. A high-frequency metal detector is best if gold is your top priority. You also need to consider how often you're going to use the metal detector. A top-of-the-line metal detector may not be worth the investment if you're only going to take it out once a year. Coil Size: Large coils cover ground more quickly while smaller coils help you to pinpoint buried metal objects. Some metal detectors are equipped with both a small and large coil to do both jobs. Maneuverability: A metal detector should adjust to suit the height of its user, and it should be lightweight enough that your arm doesn't grow tired while using it. Battery type: The majority of metal detectors use replaceable batteries that you can swap out as needed, but a few use rechargeable batteries. Once these die, you must recharge them before you can use them again. Sensitivity settings: You may be able to adjust the sensitivity of your metal detector, so it only picks up certain kinds of metals. Headphone jack: Your metal detector will beep as it goes along. Some hobbyists prefer to keep this to themselves by plugging headphones into the metal detector. Price: You can purchase a simple metal detector for around $25, but these models are usually only suitable for children. Adults interested in metal detecting should expect to spend at least $100 and serious treasure hunters may spend upwards of $250. Q: How far will a metal detector penetrate the ground? A: There are several factors that influence this, including the type of metal detector and the size of the object in question. As a general rule, metal detectors can penetrate about 12 to 16 inches below ground level. Q: How do I maintain my metal detector? A: Always consult your owner's manual for specific advice on how to maintain your metal detector. But typically, you must clean it periodically and lubricate the wires in order to keep it functioning properly. Our take: This metal detector is simple enough for beginners, yet advanced enough to please more seasoned treasure hunters. 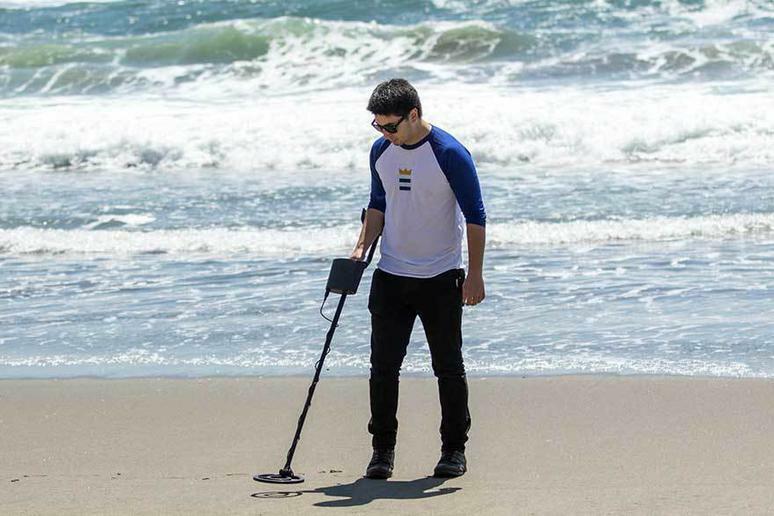 What we like: This lightweight metal detector is well-balanced and easy to maneuver. It's sensitive enough to isolate different types of metal and to search at different depths, so you don't waste time digging up old bottle caps and nails. What we dislike: It's an expensive machine, but avid metal detectors may feel the quality is worth the cost. Our take: This metal detector packs quite a bit of power and is suitable for use on all terrain. It's also surprisingly affordable, given all its features. What we like: This rugged metal detector is able to distinguish between certain types of metal and the 8-inch coil is waterproof, so it can be used close to or in lakes and streams. It can detect objects up to 2 feet deep and it's backed by a five-year warranty. What we dislike: There's a bit of a learning curve, and a few users have reported issues with false alarms. Our take: This is a simple, well-built metal detector that's perfect for beginners and children interested in learning more about the hobby. What we like: It has a pinpoint targeting feature, which helps you quickly locate where the metal object is. You receive a shovel and a carrying bag with your purchase, and the whole unit is easy to take apart and put together as needed. What we dislike: This model is a bit simplistic compared to our other picks, so it probably won't please experienced treasure hunters.